Google Translator and WordPress:How to use, implement and install google translator in your wordpress,joomla blogs or websites. 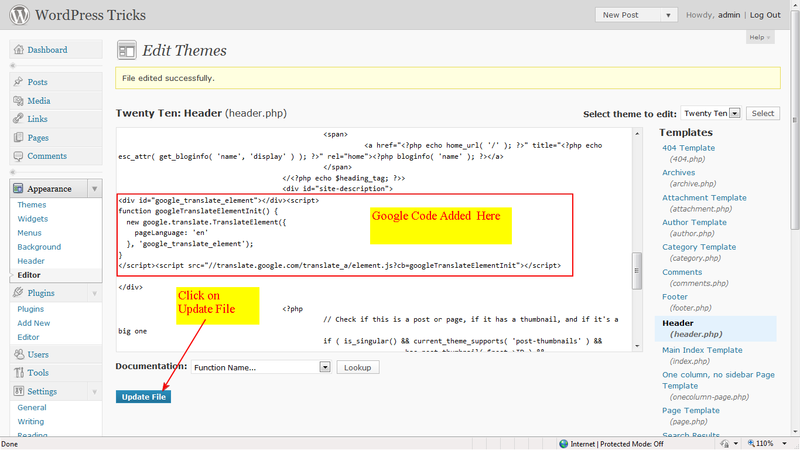 Embed code included.Translate your blog or website by Google. Today I will like to show you how to implement and show google translator in your blog or website to use it for the translation purpose of your blog or website. Here I have shown the procedure to use google translator on wordpress twenty ten theme but you can use this google translator code in any wordpress theme. Not only wordpress..you can also use this code in blogger, joomla or any other type of websites. 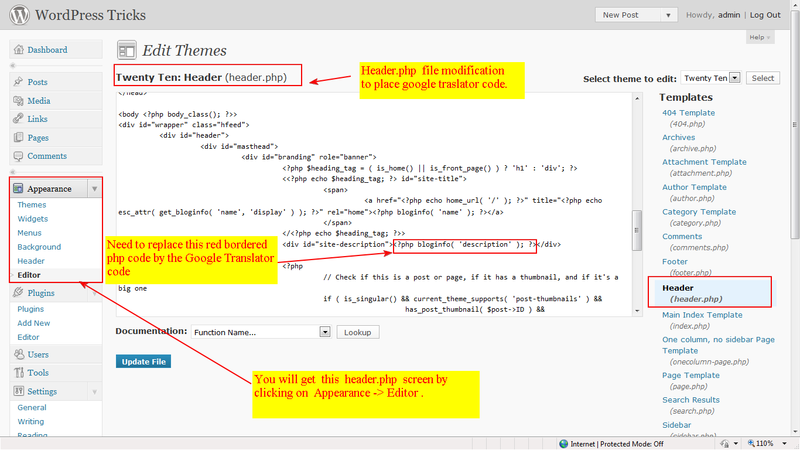 Here I have shown how to place google translator on twenty ten theme of wordpress. 3. Click and Open the Header.php file check the image below. In the picture I have marked which portion need to be replaced by google translator code. Note: Here I have replaced Site Description (just to show you) by Google Traslator option. you can add this widget in anywhere of your blog. 5. Refresh your page … You are done. Facing Problem to put or use Google Translator in your blog or website?? Feel free to knock me. Share your problem in the comments portion. 4.WordPress.com Visitors Country Flag : Where from your users visiting you. Next postWordPress.com Theme: Mystique by digitalnature CSS Upgrade and Style sheet modification: Now Modify,remove,Hide, edit or change your Header Site Title,Navigation Menu Bar,Right SideBar Widget ,Comments Section,Blog Post Title,Post Content width and background, Tags- Change Font color,font type and font size,Blank Space and more. Andrew I have replied to your mail. The problem you have mailed me have several solutions….Would you mind to check the mail i have sent to you? can i use this same idea in a different theme? I’ve got it all working fine – however, we have noticed that the navigation menu disappears when the pages are translated. Any ideas? WOuld you m ind to share me the website link where you have implemented this google translator? I’ve just realised, it doesn’t actually “disappear”. The red bar behind the menu moves up and as the navigation text is white it can’t be read. Strange! I found u have solved this problem in another way by moving the Translator to the right… is it? I had to actually remove the red bar I had behind the menu. Not sure why it was interfering with the plugin but it was. Bit of a workaround – but hey – as long as the client is happy with it, I’m happy! 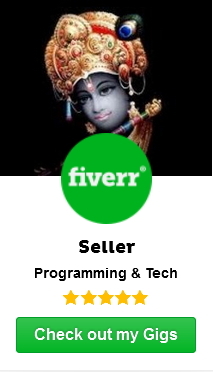 No Problem… I f you face any problem let me know..
Hi Om, thank you very much for this helpful article. It’s a blog hosted by wordpress.com and the Theme is called Neutra. It is possible to use the translate feature in this setting? as you are using wordpress.com as ur hosting..u will not be able to do it..